#2421240 – Portal is not loaded on Chrome 56. -Issue is related to Chrome browser issue and it is already in discussion / analysis and will probably be fixed in new Chrome version update / release. -Please follow KBA #2421240 and this commuinity blog in order to have updated information about the current status of the issue. are there some information about new version of Chrome that should solve the problem? This issue is very severe for us and the SAP portal update is very demanding. 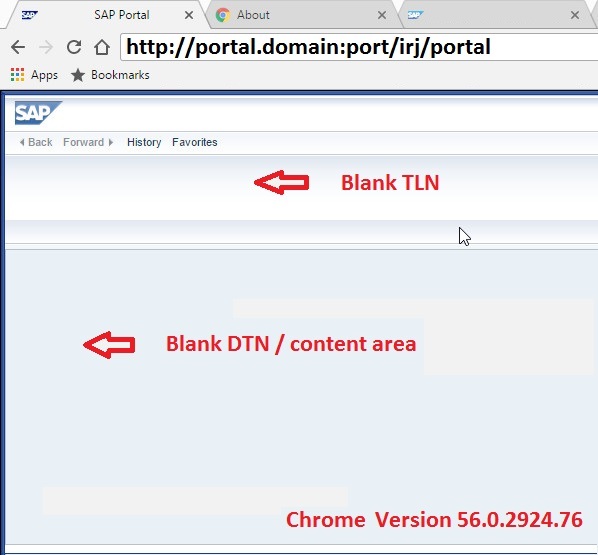 As described in SAP note #2372722, there was a fix provided in SAP Portal for Ajax frameworks to work as expected in newer versions of chrome (54, 55, 56…). -In order to check behavior for new Chrome version you can try Chrome beta. Problem persists as of today: Tested with Chrome Version 58.0.3006.0 canary (64-bit). (The Canary Build is supposedly even fresher than the beta.) … Starting Portal Update Preparation. As workaround you can try if important stuff works in the old classic theme. Many thanks! This is of great help, till we get the actual solution. The Google Chrome 56 bug with SAP Portal is a major issue for my company. SAP released 2 notes (2372722 and 2421240) describing the issue. They both claims the solution to the problem is in the latest EP-RUNTIME patch but the blog from Former Member is linking us to a Chrome forum (687061) where Google is investigating and possibly working in a solution as well. It will take us some time to implement any patch in the Portal so should I expect to have any new version of Chrome with a fix for this issue in the next days? Is SAP working with Google to find a solution to this issue in the browser side? The below mentioned are the current & minimum patch levels required to update Patch level for EP-Runtime component to 740 SP09 Patch 041 from 740 SP09 Patch 27. For our NP1 system, we are facing the same issue as mentioned in note 2372722 with Chrome 56 & above. The solution section of this SAP Note mentions about applying patch on current EP-RUNTIME component. However, it has dependency to other components which in turn leads to entire SPS upgrade of entire Portal. We would like to know if this patch can be applied, just to EP-RUNTIME? Will it not lead to dependency failures in other components? 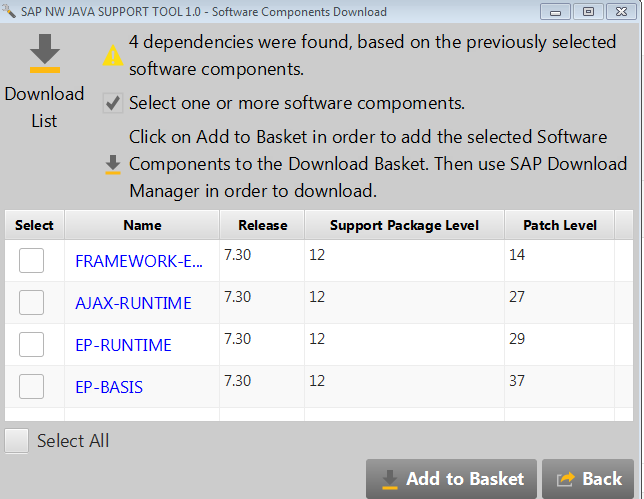 For Java systems, SAP doesn’t recommend to upgrade the SP or patch level of a single component. Instead, we have to go for a full SP upgrade, correct? We verified and EP_RUNTIME has far too many dependencies, which means upgrading all related components which are further dependent on others. Full SP upgrade is not required if only single component patch is required. Only thing is to take care of all dependent patch (can be done through SC patch tool automatically instead of calculating manually and recursively) and using consistent manually prepared directory option of SUM tool as per note 1641062. Please comment if the info helped you resolving your query..
since we don’t know when google will release the new version of Chrome (and how Axel Dubbert wrote also with Chrome 58 the problem is still present) anybody has upgdraded the portal and verified that the problem is not present? Already updated the portal to latest 7.31 19 patch level. The issue with Chrome is still present. At least, now I can access the admin page with IE (prepatched system had an issue rendering the left menu).